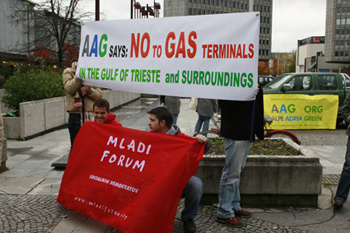 The new go-ahead issued by the Italian Minister of the Environment to the project of regasification terminal proposed by Gas Natural in the port of Trieste is to be considered one of the opinions expressed within the Environmental Impact Assessment process, therefore, it most certainly is not binding. The project must also receive other opinions, including these of the Ministry of Economic Development and of Region Friuli Venezia Giulia. Yet, not even these (if positive) would count as final authorizations. Because the final word on Gas Natural’s terminal can be only pronounced by Slovenia, within the procedure of Environmental Impact Assessment in a Transboundary Context, as already specified by the very European Commission and according to regulation (EU) No. 1391/2013. Because the European Commission does underline that: “The Commission Delegated Regulation adopted 14.10.131 as regards the Union list of projects of common interest (PCI) for trans-European energy infrastructure has indicated with regard to project number 6.19 ‘PCI Onshore LNG terminal in the Northern Adriatic (IT)’ that ‘The precise location of the LNG terminal in the Northern Adriatic will be decided by Italy in agreement with Slovenia’. Due to this, Slovenia’s opinion is binding as part of the procedure of Environmental Impact Assessment in a Transboundary Context.